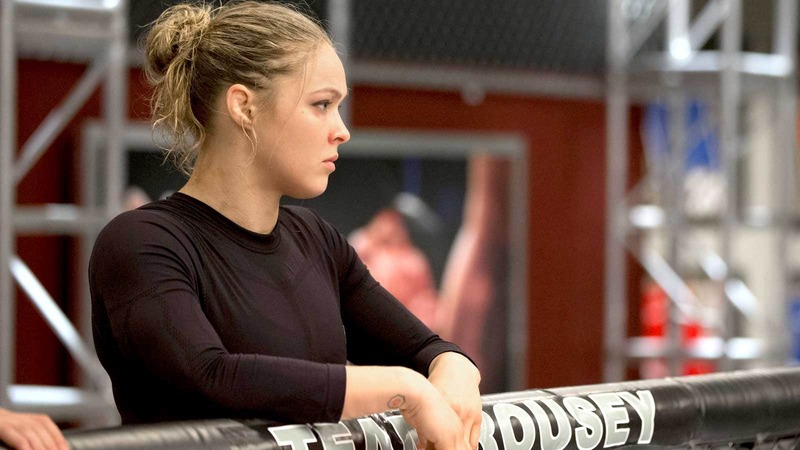 Ronda Rousey opened fire about her brutal experience during the production of 'The Ultimate Fighter'. Ronda Rousey absolutely hated filming ‘The Ultimate Fighter.’ But she doesn’t care if people view her differently after seeing what was a very miserable version of herself on the reality show. And she says it in a way only Rousey can. How long ago was it that Kim Kardashian had d**ks in her mouth and now she’s selling my little sister shoes? "We were just really mistreated and really disrespected by the whole production staff and just everybody," Rousey said. "We were instigated and manipulated to get the most dramatic response out of us possible." Rousey, who defends her title against Tate on Dec. 28 at UFC 168 in Las Vegas, said she was shown flipping Tate and her assistant coaches the bird, but her shaking their hands after fights was not shown on the show. She also accused Tate and her team for sabotaging one of her fighters, Chris Beale, before his fight with Team Tate’s Chris Holdsworth. Rousey said that just before the fight UFC president Dana White entered the locker room to ask Beale if he was under contract with another organization. The promoter for that company had called and threatened legal action if Beale fought. Rousey said that it could not have been a coincidence that the promoter knew exactly when Beale would be fighting on a show that is supposed to be kept secret until it airs months later. She believes Tate dropped the dime. Beale did end up fighting and losing. The reality show aspect didn’t do anything for Rousey. She was more interested in helping the young fighters, especially the women. The reason she agreed to do it was because saw a way to develop the women’s bantamweight division so it can carry on when she retires. "If you think ‘The Ultimate Fighter’ was the best opportunity knocking on the door for me to do at the time, you’re tripping," Rousey said. "It needed to be done for those girls." Rousey has formed strong friendships with almost her entire team. Michael Wooten and Beale visited her to train in Bulgaria when she was filming ‘The Expendables III.’ Davey Grant has come to California to train with her. Shayna Baszler and Jessamyn Duke even moved in with Rousey and her roommate Marina Shafir. She called Tate and her boyfriend Bryan Caraway "b***h kids" because they would complain to White about fearing someone on Rousey’s team would physically harm them, yet they were still trying to incite Rousey and her coaches. She believes Tate brought assistant coach Dennis Hallman on the show to fire up Rousey’s head coach Edmond Tarverdyan so he would do something that would get him kicked off. Hallman ended up being the one asked to leave. Rousey has still not watched this season of ‘The Ultimate Fighter’ and said she hasn’t paid attention to all the hate coming her way. But she said she’s not worried about how this will affect her persona long term. "Everyone’s memory is as long as their Twitter timeline," she said.